Welcome to the Riverside County Cross Country Website! This website is intended to promote and highlight the efforts of the athletes and coaches that participate in Cross Country at the high school level here in Riverside County. We want this website to be the effort of many, not one. Please feel free to send us pictures, articles and results. Great Oak dominated the action here by winning just about ever race they were entered in. Very nice performance by Beaumont and La Sierra's varsity boys as well. Top results listed below! Still inputting all girls under 21 min. The CIF Committee overseeing the sport of Cross Country made it official. As much as a shock this may be for those outside 'the circle of trust' the rundown, forgotten abandoned golf course near downtown Riverside will be the site of the 2015 CIF Prelims. The course committee plans on hosting an invitational (2.25 miles) on this course on September 5th while also hosting another invite on Saturday, October 24th. Of course, this upcoming November will be the real show where all five divisions will compete at the CIF Prelims! There is also a slight chance it may also host the following weeks' finals. But, the plan here is that the Riverside City Golf Course will be the site of the 2016 and 2017 CIF Postseason where all teams in the Southern Section will run through this course en route to a possible state meet berth! With both athletes boasting, perhaps, the greatest seasons ever put forth in any one year, our 2013 Athletes of the Year both rewrote the record books! Both broke the Riverside County record on the Mt. SAC Course. Both led their squads to their best season in school history while one even led her squad to arguably the greatest team in California State history. Great Oak sophomore Destiny Collins in our 2013 Girls Athlete of the Year. She not only broke the county record on the Mt. SAC course but went a step further and also broke the all time record for the Woodward Park course as well. In doing so, she led her team to a 2nd straight Division I CIF and California State Title while they easily qualified for the Nike Team Nationals! Perhaps disappointed by their 8th place finish, that disappointment quickly faded when reflecting back on the fact that their team broke the All Time course records for the Mt. SAC and Woodward Park courses. Head coach Doug Soles referred to Collins as one of the most competitive girls he has ever coached, not only in the races but also in the daily training. She easily ran to the Southwestern League Title and won the Inland Empire Championships. Adding to her resume, Collins captured the Division I CIF Title when she roared to a 17:10. Even more impressive was her 17:09 at the State Championships, which shattered the previous county record by 24 seconds! Needless to say, this was a no brainer in selecting Collins while it was nice to see her bounce back from a freshman season that saw her go down to injury during Great Oak's 2012 postseason run. In the spring of 2013, Collins showed up all what we missed out on as she qualified for the California Track state meet in both the 1600 and 3200 meters while setting a new county record in the 3200. Indio senior David Luna truly came into his own this season holding off a strong field en route to the Division III CIF Title and new Mt. SAC county record. After a slow start to the season, losing two months of training to a sciatic nerve injury, Luna qualified as an individual to the Nike Team Nationals. Moving to the Desert Valley from Colorado as a sophomore, Luna established himself as one of the best in the county during the 2013 track season. In racing to CIF titles in the 1600 and 3200, Luna qualifying for the state meet in the 1600 (4:11) and 3200 meters (9:05), we anticipated a great XC season! Luna performed even better than we thought, breaking 14:40 in back to back weekends on the Mt. SAC course, including a new all-time county record of 14:33 in his CIF title! He rolled to a 15:03 runner-up finish in the Division III State Championships. He was the Inland Empire Challenge champion while cruising to the Desert Valley League title. On top of his individual accomplishments, he was the catalyst in leading Indio to a surprising state meet appearance! Barely qualifying for the Division III CIF Finals a week earlier, the entire team stepped up for that 7th and last spot for their first ever state meet. Even greater than both of Collins' and Luna's individuals accomplishments, it was great to see them be the primary reasons for both of their teams' overall success. As expected, the women from Great Oak dominate our listings below. To go a step further, the Southwestern League as a whole is very well represented as it continues to be one of the most competitive leagues in the nation. To give you an idea of Great Oak's presence, their women would defeat the rest of the county if we combined the rest into another squad! Breaking 19 minutes on the Mt. SAC course is simply not what it used to be as, like the boys, we're seeing the results of improved training methods and higher expectations over the past ten seasons. We have a number of girls that broke 19 on the Mt. SAC course that did not get recognized on any of these lists below (we could comprise a 4th Team of all sub-19 minute girls)! We hope to finalize all of this as soon as possible but wanted to provide you with what we have produced thus far. Thanks to Keith Chann for being of GREAT assistance and providing with additional insight on developing these lists, both boys and girls! We have selected our Boys' All-County Squads for the 2013 season. We had more boys than ever eclipse the 16 minute barrier on the Mt. SAC course, which made it tough to select these athletes. We could have easily comprised a 4th All-County team, made up of boys that broke 16 minutes. Only seven of our 21 selections are seniors, so we only expect to see more guys breaking 15:30 next year.... Juniors that broke 15:50 and sophomores that broke 16:20 did not even make our list! Riverside County has just gotten that much more competitive over the years. We did take the CIF postseason, Inland Empire Championships and league meets into consideration. Led by sophomore Destiny Collins, who shattered the Riverside County state meet individual record by 24 seconds, Great Oak's girls captured their third State Championship in the past four seasons. To put a serious icing on the cake of victory, they also broke the all-time Woodward Park course record, averaging less than 18 minutes per scorer! Senior Haley Dorris just missed the previous individual record with her 17:34 performance while fellow senior Ashley Helbig also broke 18 minutes in the relatively easy victory. They were almost two minutes ahead of the next best team in the state (Simi Valley) and their #7 was ahead of the Div. I runner-up's #4 (Davis). Sophomore Desiree Stinger and junior Maiya Larsen rounded out the scoring to officially elevate this 2013 Great Oak squad as the greatest in California state history! They easily qualified onto next weekend's Nike Cross Nationals, where they will look to defend their recent #1 national ranking. Indio's David Luna will join the women of Great Oak next weekend up in Oregon. His 15:03 runner-up effort in that awesome Division III race easily qualified him for Nike Cross Nationals as he rolled to the 2nd fastest time in county history for the state meet. While his squad took 11th place as a team, the boys from Rubidoux took 6th place. 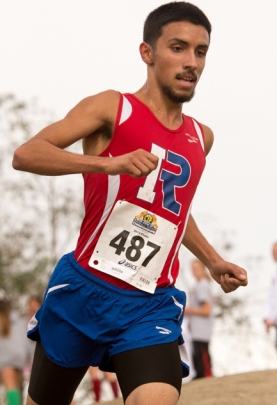 Virtually returning their entire squad for the 2014 season, junior Luis Ramos led the Falcons with his best race of the season. He made his way to the podium with his 5th place, 15:14, effort. This is now the 5th fastest time ever in county history at the state meet. He was THE fastest junior of the entire state meet and was the #2 underclassman overall! This definately made up for a frustrating CIF Finals race. Looking more to the future, freshman Erik Gonzalez ran the 3rd fastest time of any freshman overall of the entire meet. Often overlooked while in Great Oak's shadow is the continued success of the Vista Murrieta girls! This is their 5th year in a row qualifying for the California State Meet as they produced a modest 10th place finish here. They basically return everybody here for the 2014 season as they were led by junior Ashley Cahalan and her solid 18:13 performance. Josie Guinn's 18:16 was one of the best freshman efforts out of the entire state meet and the 3rd fastest in the Division I race! Individally, Murrieta Mesa Taylor Taite got onto the podium with her 17:44, 9th place finish in that competitive Division II race. By clicking onto the California State Meet on our menu to your left, you will see that this group of young women continue to rewrite our county record books. La Quinta's Megan Huebner finished up one of the best prep careers in county history with her 18:00 effort. That time often makes the podium, but in that Division I race, it was only good enough for 19th place. Freshman teammate Marissa Rodriguez finished in 38th place with her 18:33 effort. Great Oak's boys qualified for the state meet again and took 11th place in the Division I race. In breaking 81 minutes against a stellar field, they were one of the youngest squads and will return five of their top six next season! Off just slightly from last week's CIF Finals performance, junior Nick Doan's 15:53 paced the Wolvepack up front. Robbie Gleason was one of the few sophomores that clocked under 16 minutes at this year's state meet to also shine. Individually on the boys side, Roosevelt junior Branden Randall turned in his best performance of 2013 with his 10th place podium finish. His 15:27 effort ranks him as one of the top underclassmen returning back for 2014 and places him now amongst the top 15 ever in county history for the state meet. In the Division II race, Canyon Springs' Hector Hernandez put together a solid effort with his 15:49 clocking. On the boys' side, our top boys' squads in the county faded down the stretch. But, Great Oak and Rubidoux both finished amongst the top 25 squads in the state when merging the Top 40 squads together. Both expect to be ranked amongst the Top 10 squads going into 2014. Luna and Collins Set County Records along with Great Oak's Girls! With a solid rain storm coming in on Thursday, most of us figured that we would be competing on the rain course...again. Positive reports began circulating on Friday afternoon, but yet, most of us still held out, preparing for the rain course...again. Historians rest assured, with the sun rising on Saturday morning, alas - we were competing on the regular course! By noon, we witnessed the greatest day of results from Riverside County athletes on any one day. Both individual county records went down while Great Oak's girls shattered the all-time Mt. SAC record while obviously smashing their own school and county team time record. Meanwhile, their boys recorded the 3rd fastest time ever in the midst of competing in the fastest race in Mt. SAC history. Overall, we witnessed two individual CIF titles and two team CIF titles. Led by sophomore Destiny Collins' 17:10 CIF victory, which also set the county record, the girls from Great Oak shattered their own county record en route to another CIF Title! In roaring to a 87:58 team time (17:36 average! ), they also shattered the all-time Mt. SAC Team Time course record! Head coach Doug Soles hinted for weeks leading up to this effort but who knew that they were over 90 seconds faster than any other team in the entire Southern Section! We knew there was a reason for waiting to update our All-Time Riverside County marks list as Great Oak truly brought their absolute best here! To further expand, GO only scored 38 points in the victory, demolishing a very stellar field there in Division I. Seniors Haley Dorris (17:19) and Ashley Helbig (17:35) provided the best 1-2-3 combo perhaps in Southern Section history. Keep in mind that Collins was lost to injury last November, as two newcomers to the line-up, sophomore Desiree Stinger and freshman Kiyena Beatty provided the knockout punch with their 17:52 and 18:02 efforts, respectively. Lost in the limelight of Great Oak's incredible team effort, fellow Southwestern League foe, Vista Murrieta shined on their own stage. With three girls breaking 18:15, they exceeded seasonal rankings and finished 4th place in Division I. They were led by junior Ashley Cahalan's 17:57 breakout performance! They just missed their own school record as they broke 93 minutes! Moving over to the boys, Indio's David Luna just missed Lane Werley's county record last week at prelims. This week, he never let off of the throttle and jetted to the Div. III CIF Title and 14:33, eclipsing the record by two seconds. Luna, moving here from Colorado two years ago, has now moved himself amongst the best in the nation with these back-to-back performances. Indio's team was THE surprise performance for the county on the boys side here as they took 7th place as barely qualifying last week! Not once this season were they ranked in the Top 10 for this division. Despite some adjusting of their lineup in recent weeks, Great Oak's boys worked their way to another state meet berth. Junior Nick Doan and his 15:05 effort probably saw him only qualifying as an individual, but when the dust settled, they qualified by a mere four points and that last 7th spot. That Boys Division I race goes down as the fastest race ever in CIF history, where eight teams broke 78 minutes! Great Oak's boys, almost all underclassmen that will easily be ranked #1 in the section (and state perhaps) in the 2014 preseason rankings, ran to the 3rd fastest team time in County History! Senior Patryk Giba finished a fine Mt. SAC career with his 15:32 effort as GO will return four of their top five from this race. When informed that they had moved up from Division V to Division IV, Xavier Prep head coach Aaron Lyons simply told his squad that they had to move up their expectations as well. THAT they did....! In another surprise from the Desert Valley League, XCP captured the Division IV CIF Team Title. Continuing his fantastic season, senior Emery Caster's 15:12 third place performance paced his squad to the victory! Juniors Hogan Lizza's 16:04 and Joe Janssen's 16:11 gave XCP a 22 point lead after three scorers as they held on for the nine point victory! Caster is their only senior leaving this squad in 2014. El Reciemento de Rubidoux is confirmed! Head coach Keith Chann has elevated, what was once the most sucessful boys program in the county, Rubidoux back to the state meet! Despite being off just a tad, they held on for a 6th place finish in the Div. III race. Their 79:05 team time was the 2nd fastest in the county as Luis Ramos' 8th place finish paced the Falcons. Despite being tripped 20 seconds into the race, Ramos regathered himself to still run an impressive 15:06! With everybody at their best, they will be seeking a Top three podium spot next weekend. Freshman Erik Gonzalez' 15:32 effort sets the new FRESHMAN county record as he was the their #2 on this day. They return ALL seven boys and will easily be ranked amongst the Top 10 teams in the state going into next season. After a frustrating 2012 season, Billy York's Woodcrest Christian squads are back in the California State Meet! Led by freshman Marissa Thompson's 18:47 third place finish, their girls earned the 2nd place plaque in Division V. As they seek a podium spot next weekend, they will return six from this lineup. Their boys hold the record for the most consecutive state meet championships in state history, and with this young squad, they might be back there in 2014. Justin Austin Dubyak's 16:24 effort paced the Royals. They return everybody for next season, including three sophomores and a freshman. Individual qualfiiers include Roosevelt junior Branden Randall. Going along for the ride in that Division I boys race, his 15:03 finished 9th overall, while being the #2 overall individual. Canyon Springs' Hector Hernandez bounced back from a frustrating last two months to qualify in the Div. II Boys race with his 15:12 time, 8th place finish. He was the 4th individual qualifier in that race. Linfield Christian senior Andrew Russell and Hamilton junior Devyn Gollery both qualified as individuals in the Boys Division V race as well. Individually for the girls, La Quinta pulled off a rare feat in qualifying two girls. La Quinta freshman Marissa Rodriguez passed her own teammate, senior Megan Huebner with 17:45 and 17:46 times. Upon finding out that their team finished 10th overall, both move on as individuals. This topped a GREAT showing from the Desert Valley League on this morning. Also moving on for her second season was Murrieta Mesa junior Taylor Taite. Her 17:45 was a Mt. SAC personal best for her. In Division V, Linfield Christian, like La Quinta, also had two girls qualify for the state meet. But, Jackie Crowther declined, opting for soccer next weekend. That leaves sophomore Brianna Wilson on her own next week as she will seek a podium spot.